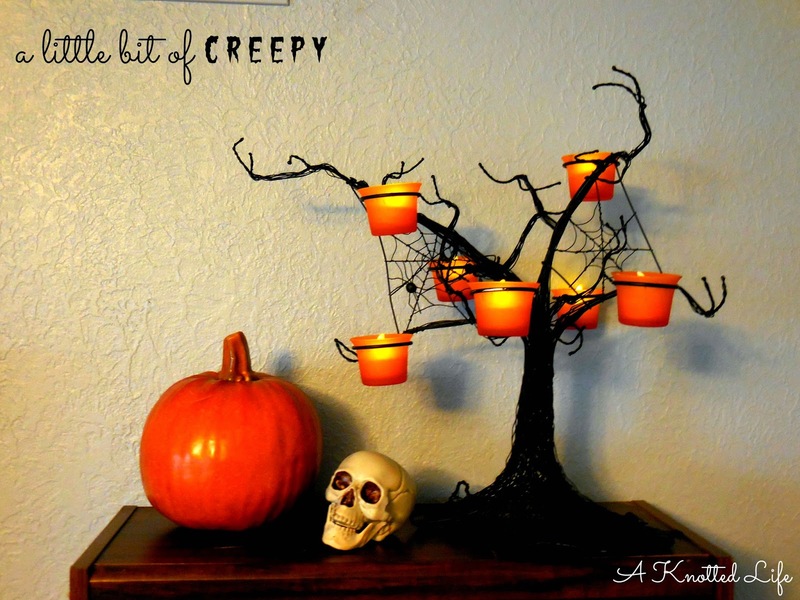 When it comes to decorating for Autumn I have two rules. #1 - Nothing Fallish before September 1st. #2 - Nothing Halloween before October 1st. I regularly break both those rules. 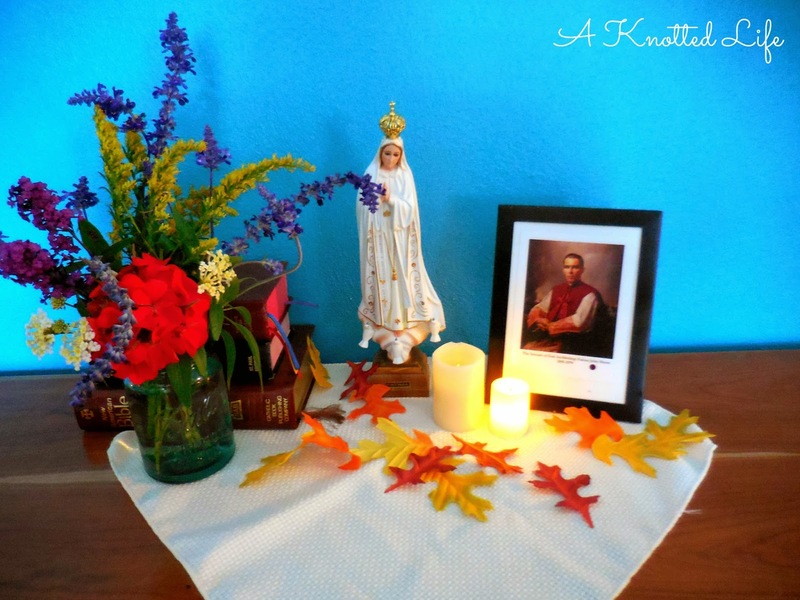 I don't know about you, but I love seeing how other people decorate for special occasions. It can say so much about one's style, sense of humor, and beliefs. I always appreciate seeing the thoughtful and fun ways people mark the seasons and celebrations in their homes. 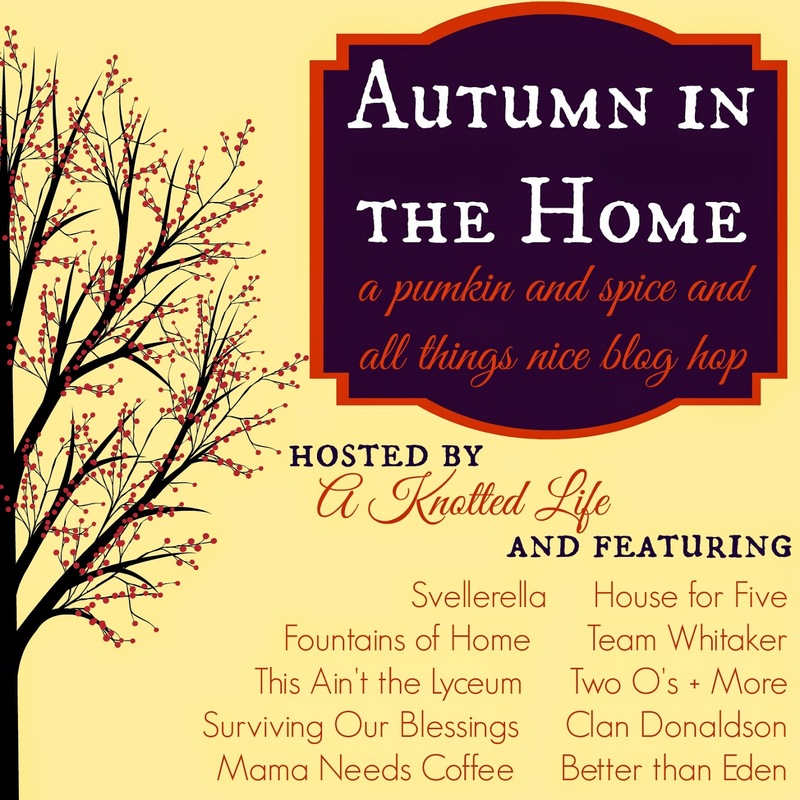 That's why I asked a handful of my favorite bloggers if they would join me for a blog hop. 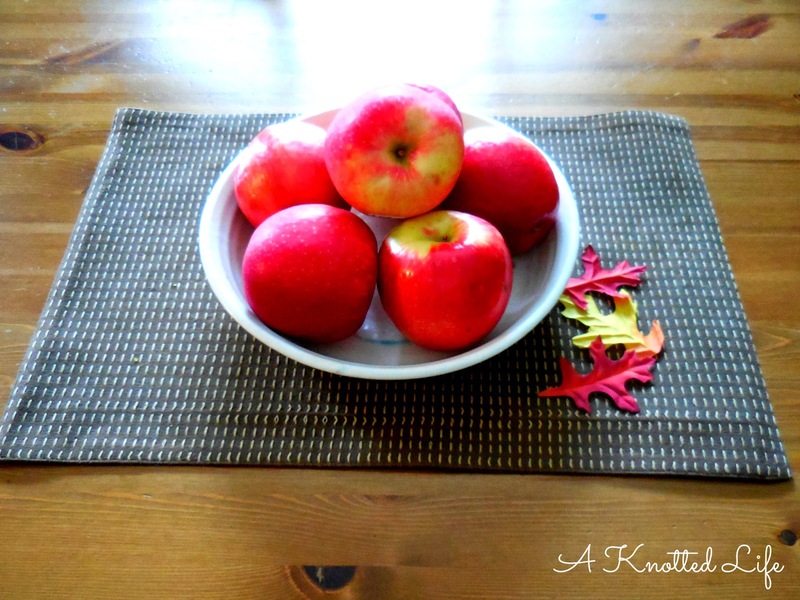 Today we're each showing off our Autumn decorations. Get yourself a pumpkin spice anything, get comfortable, and enjoy! Here's a look at my home during September, October, and November. My husband is a physics teacher in an area public school and two of my children attend parochial school with one more in the Early Childhood Education classroom at the local public school. After a long summer, September really is "the most wonderful time of the year." 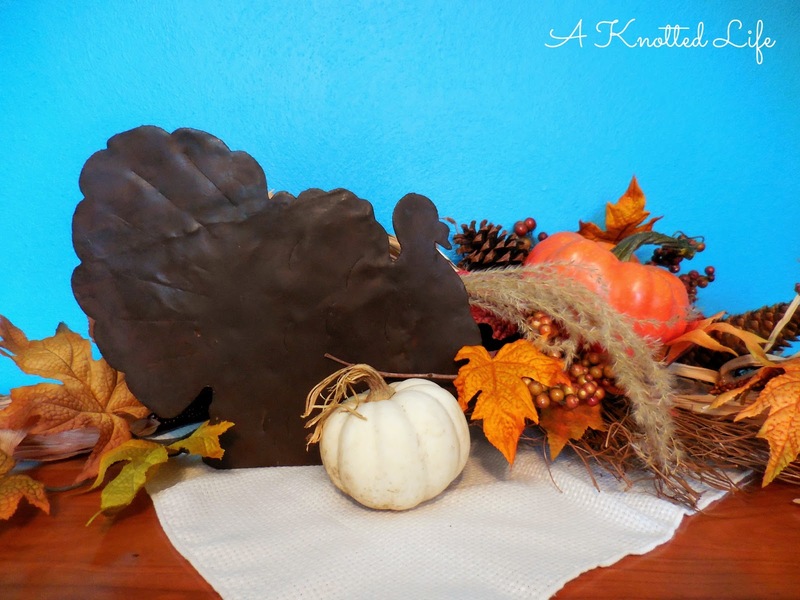 A little more about our mantel. I made this wreath for less than $10 from items in the WalMart craft section. I love way the colors pop against our front door. 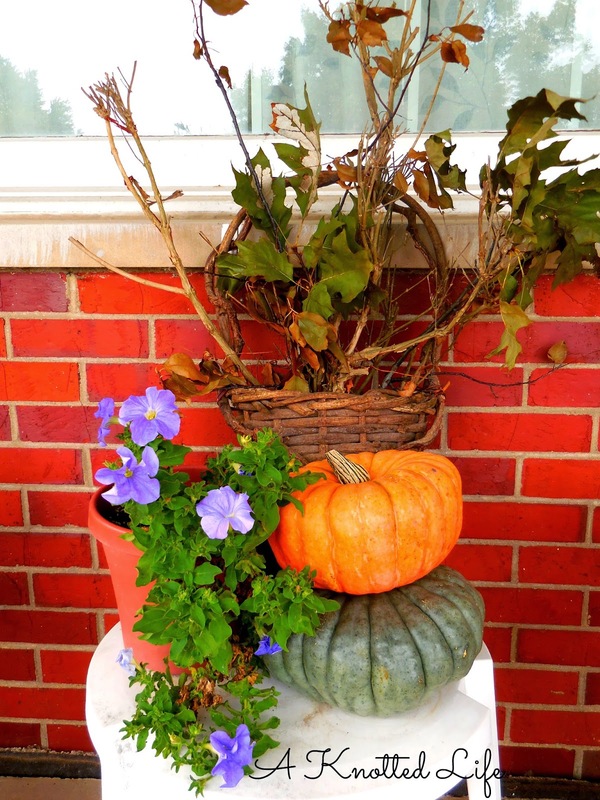 A little vignette on the front porch. Many of September's decorations remain but the mantel gets a new treatment and many more items come out of storage. The white board in the back is actually one of the ceiling tiles we ripped out of our basement. The tombstone I made for my parish's All Saints' Halloween party. The ghost carrying the pumpkin was my mom's and I have always loved it. She gave it to me a few years ago and it's one of my favorite things. I made this wreath a few years ago but added the bird this year. 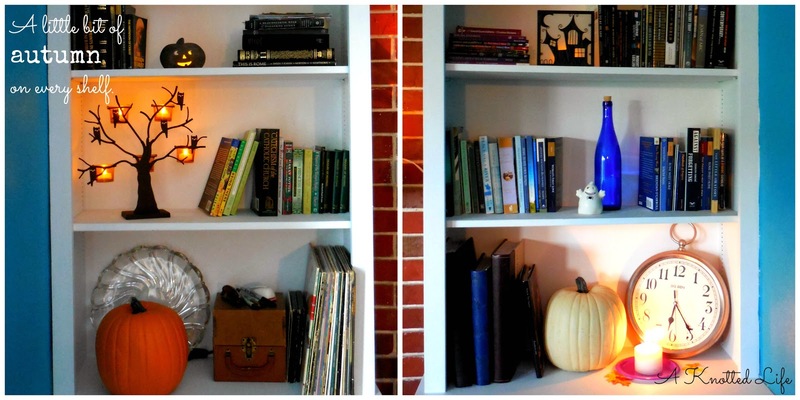 A little bit of autumn on every shelf. The chalkboard is back in the playroom. 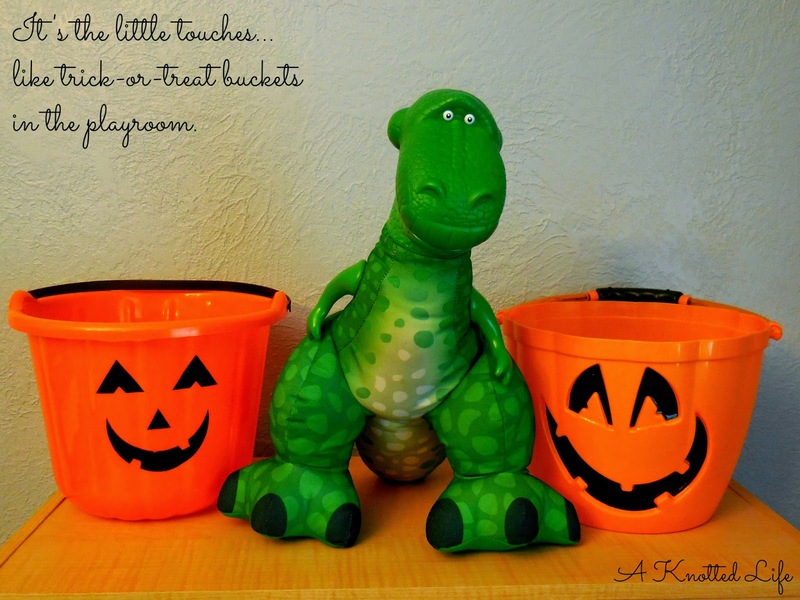 Halloween and Fall books in the book basket. 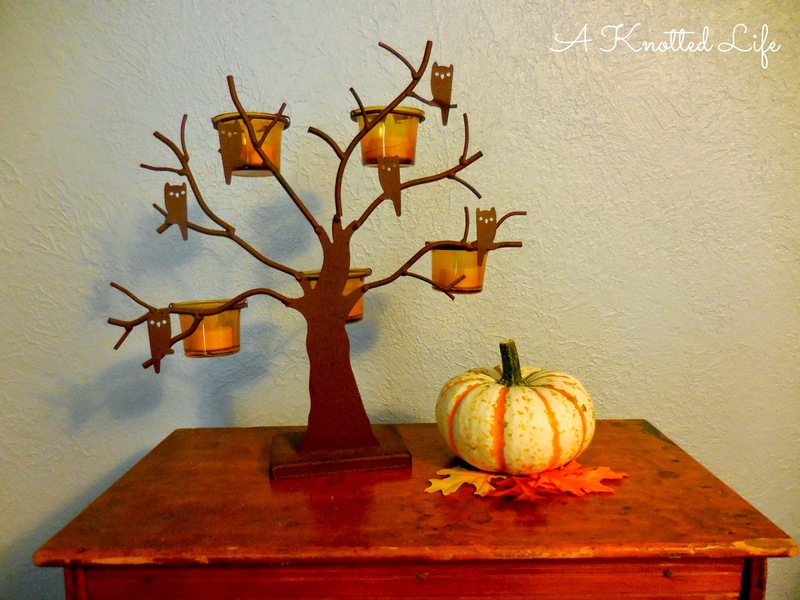 Even the owl lamp is dressing up for Halloween. I found the print on Pinterest. Once again I reuse a lot of the same decorations. My door wreath and the leaves on the mirror remain. Other items get moved around a bit and overall it feels a lot more simple than Halloween and October. 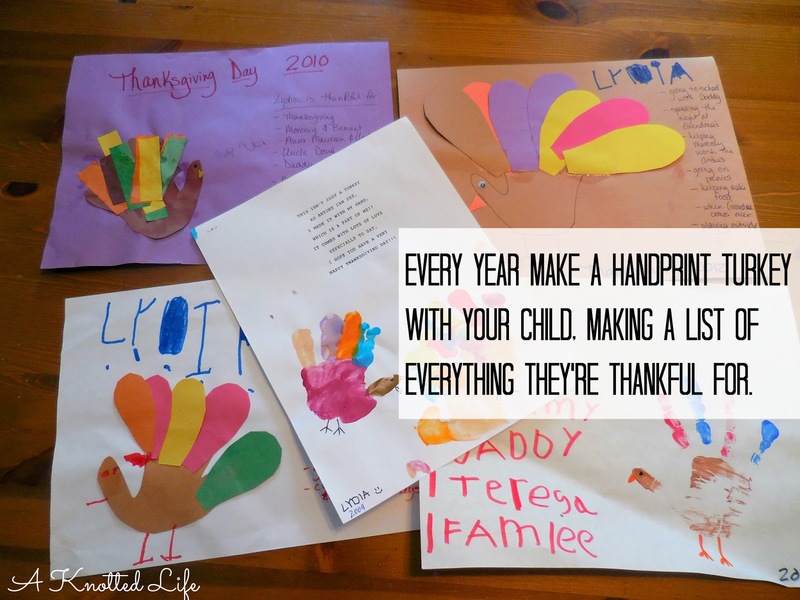 Early in November the kids and I make turkey handprint crafts with a list of all the things they're grateful for. The pictures hang in the house through November and I keep them with the decorations so each year I can reminisce a little as I pull them out of the box. So that's my house all autumn long but I'm not the only one showing off my decorations. There's a whole group of us doing a Blog Hop today.Check out all these other lovely ladies and all their fabulous decorations. Oh my goodness- what beautiful decorations you put up!! 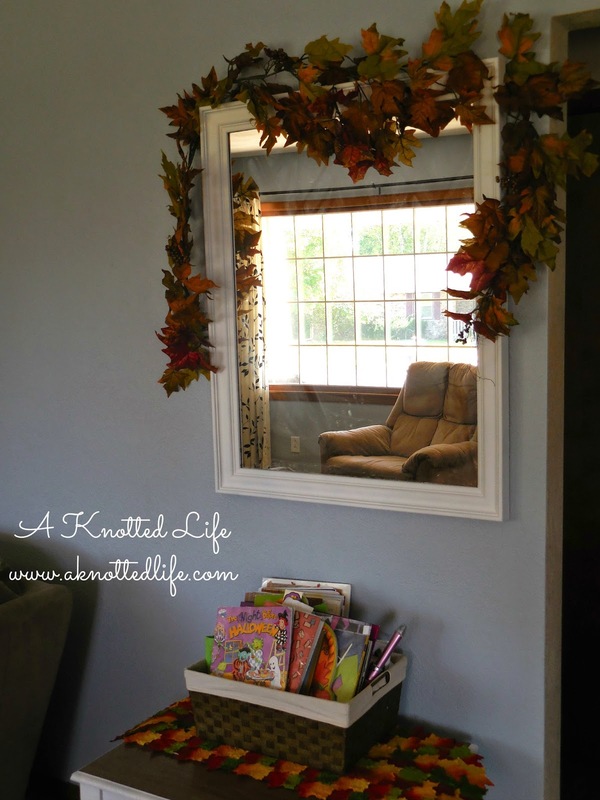 My absolute favorite is the leaf garland over the mirror. Lovely! Goodness, you are making me want to decorate my house! But it doesn't even look that much like fall here yet, which is horribly depressing. I think this is the first year in all my memory I still have the AC kicking on. I am deeply worried I am not going to have my favorite season this year! So maybe decorating might help! 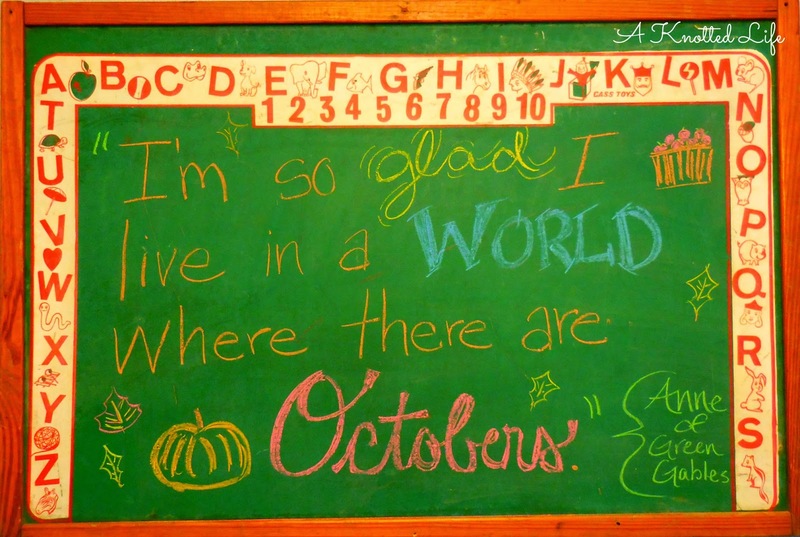 I still love that chalkboard and I'm so impressed you can decorate by month! So nice! 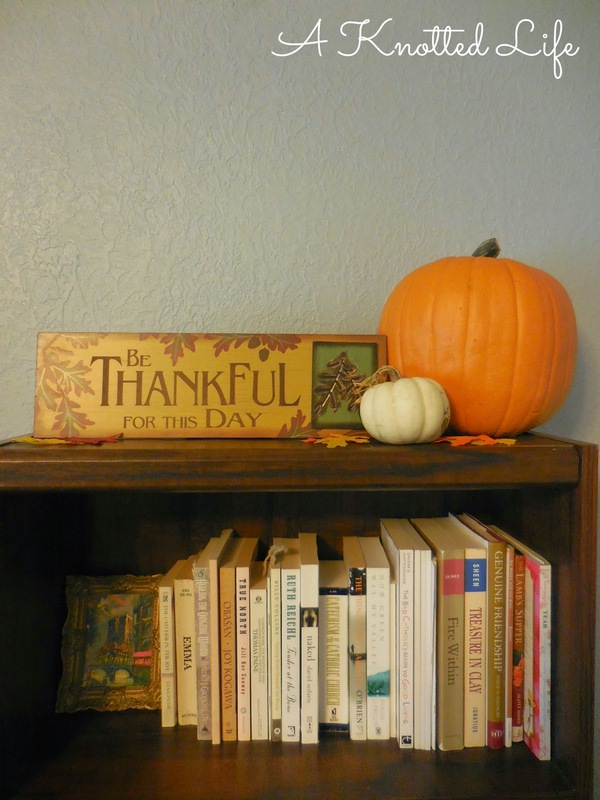 Every year I say that I'm going to start decorating our home, and every year something happens to our budget to prevent me from shopping (even the end of season sales!) for decorative items. 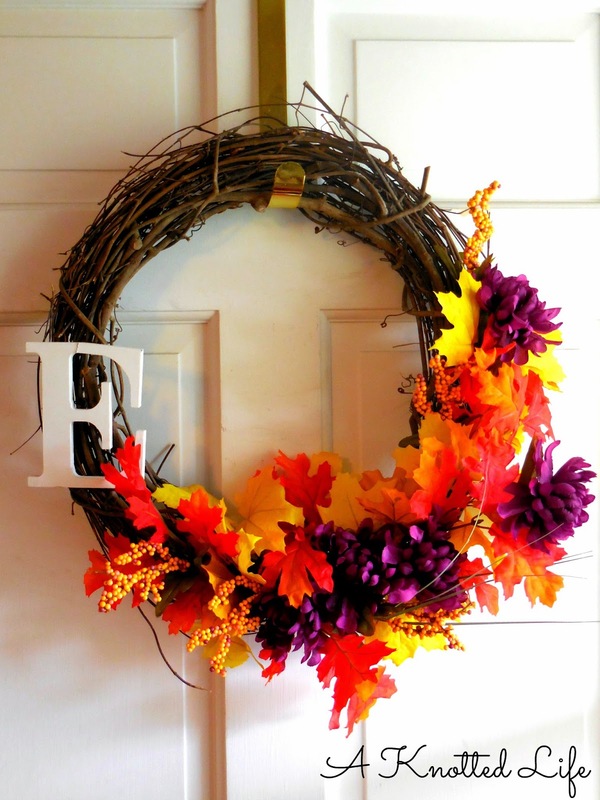 I do have a fall wreath though that I should break out and touch up. All of the decorations are great, but you're right- that ceramic ghost from your mom is the best. I just love the ghost's expression! What a great piece. I agree - that ghost from your mom is the best! I love how you transition from month to month and now I feel the need to watch all of the Anne movies :) Thanks for hosting, Bonnie! 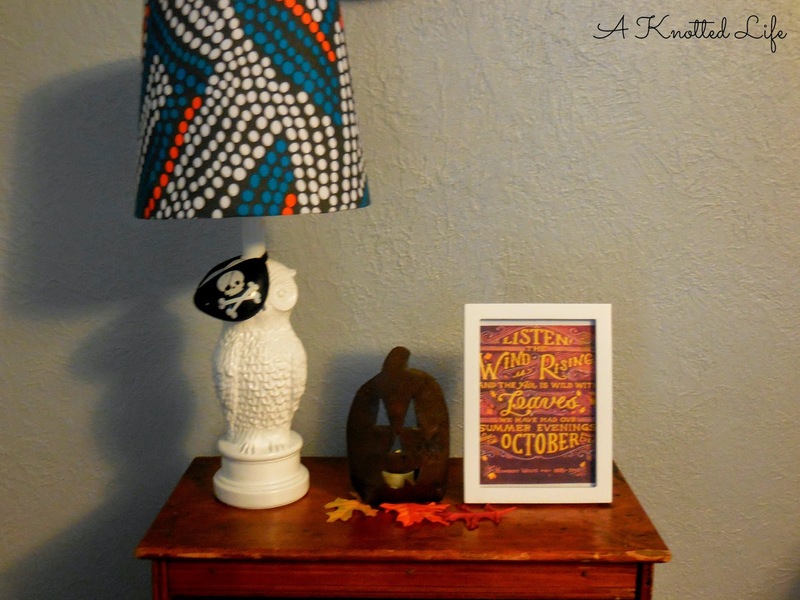 So impressed with your month by month decorating! You're so put together. What beautiful things you've collected! I love that chalkboard and think I will start looking for one similar. Great stuff, Bonnie! I'm so glad you did this, Bonnie. And I love how you're a rule breaker - you crazy cat, you. So cute!! 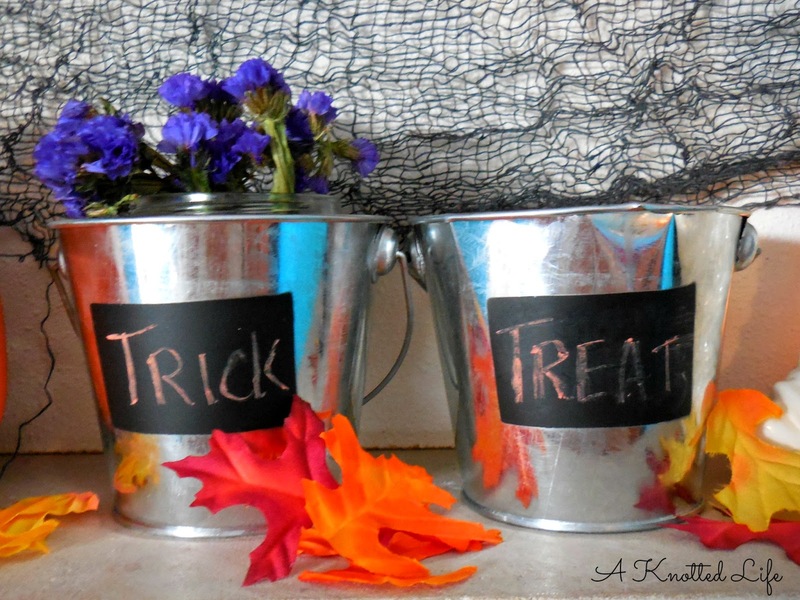 Love all the fall decor! We are in the middle of movig and staying at my in-laws so I won't be able to do any fall decorating this year. :/. So, your hubby is a physics teacher!? Did he get his degree in physics? He and my hubby should totally connect! My hubby just got his PhD in physics from the university of Florida. I love this! I am not very great at seasonal decorating (I pretty much just do Christmas) but it's something I've love to get better at, so I'm really enjoying all of these ideas! I'm so glad you hosted this party- it was a lot of fun, and my house looks a lot better at this point than it would have if I hadn't needed to photograph parts of it. Girl. You have houndstooth carpet? No. Way. Want! We do, but how did you see it? Your photos, and your home, are gorgeous. Love. 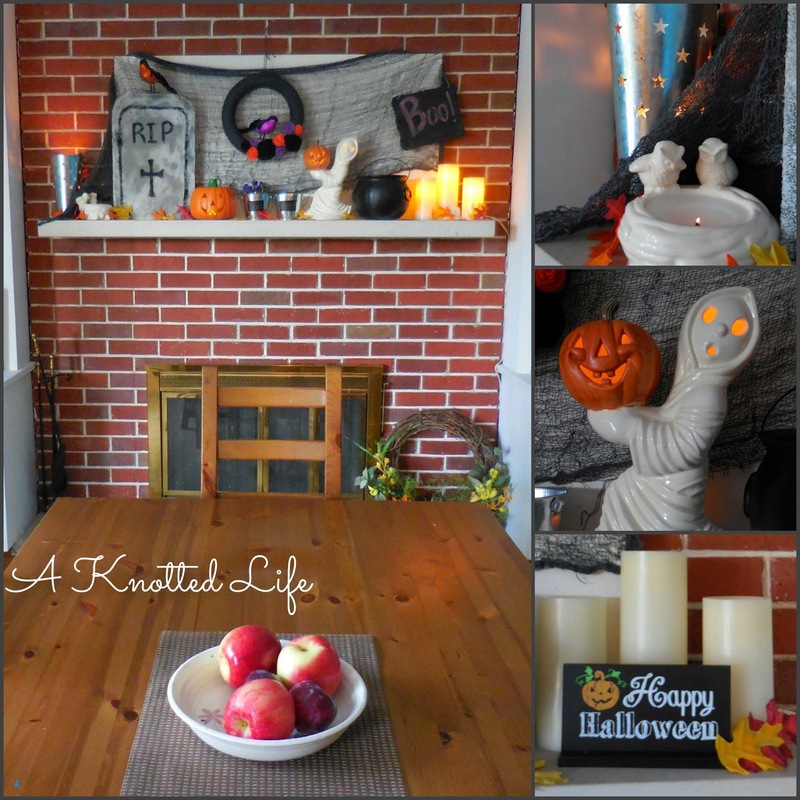 I love your decorating style!! You have inspired me to get out my fall decorations. We're moving in late November and I wasn't going to mess with it, but now I'm pumped to spruce up the joint! Look at you getting all nice and stylish for each month! 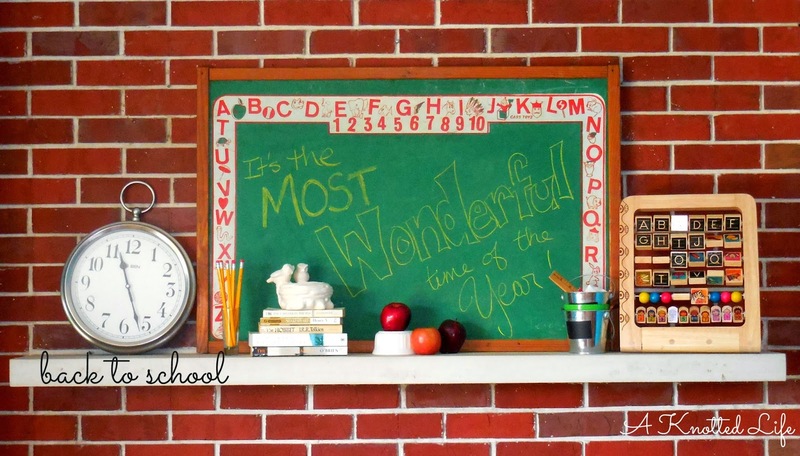 I love the back-to-school mantle...I've been wanting to do that for a few years, and then never do it. So lovely, all of it! Very lovely Bonnie! You set the bar high. Some day I will grow up, dust off all my old copies of Martha Stewart Living from 2001-2003 and make something of this dump of mine. I love all of your decorations Bonnie. 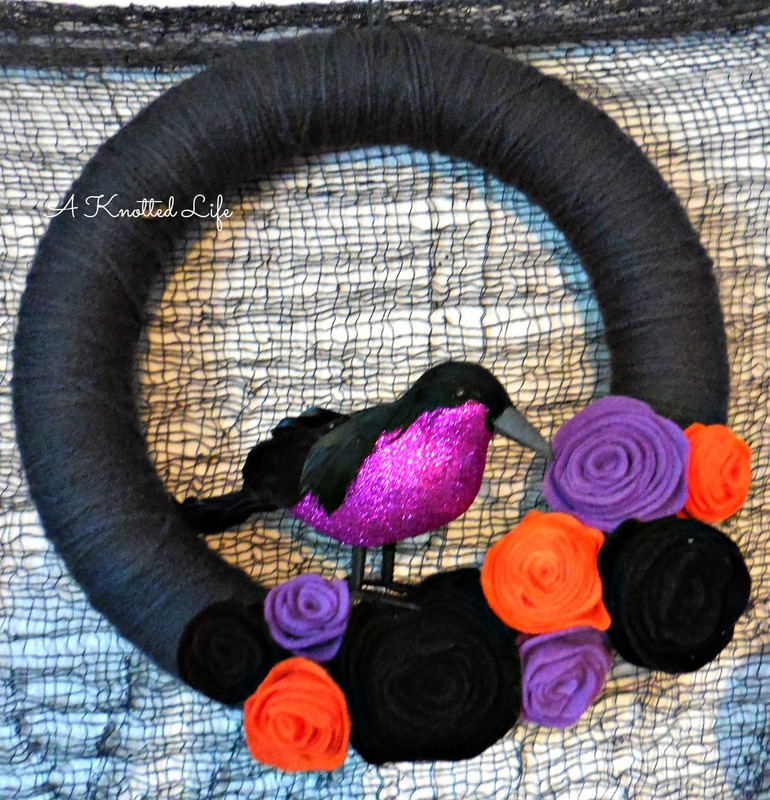 Can you do a wreath tutorial as a post one of these days? I've seen DIY wreaths all over the place but have never really figured out how to do it neatly and cheaply. My favorite is the black one with the purple flowers and the bird.